So this weekend was a three-day weekend, and we decided that we had spent enough time at home. It was time to get out into the woods. The only problem was that our favorite haunts were covered with many feet of snow, and we have yet to contract the snow-camping bug. So we looked for something warmer, along the coast. After a lot of research, phone calls, and even a trip to a couple of stores, we decided on the Los Padres National Forest, south of Monterey. 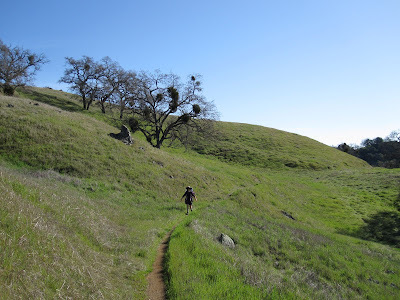 We bought the maps, charted our route, and then, at the last minute, decided to go to Henry Coe State Park instead. Why? It's a shorter drive for us, and and we'd always wanted to see the park. And once P called the ranger station, and got a great recommendation for a trip, the die was cast. Sunday morning we drove down to the park, and watched the fog disappear as we drove. By the time we got to the entrance, it was sunny and even a bit warm. And as we climbed up out of the canyon into the park, it got positively steamy. whew! The humidity was a lot higher, so while we were sweating up a storm, it just dripped down our faces and covered our bodies. ugh. The trails in this park have their own unique logic: most of them follow old ranch roads, so they tend to follow the tops of the hills and ridges. If they ran along the side of a hill, the old trucks would have rolled over sideways. So they go straight up and straight down--rather than going around. Steep grades, sometimes only to lead to an equally steep grade on the other side, going down. Up and down, over and over. oof. The trail we took had about 2500 feet of climbing in five miles, and we counted a total of two switchbacks. Why go around when you can go straight over the top? We know why. Did we mention the humidity? Daytime temperatures were in the high 60's so it was hot, going uphill in the sun. Evening temps dropped quickly into the 40's---and eveything was covered with dew. Everything--even in the inside of our tent. Luckily, it didn't drip on us all night---just soaked whatever touched the inside of the tent. Finally, we have to talk about those short days. One of our concerns about snowcamping is that we would have to spend a lot of time sitting in the dark in the cold. Night came at 6 p.m., and we finished our dinner by headlamp. A quick cleaning up, and then we looked at the stars until our clothes started getting wet from the dew. By 7:30 we were in the tent, reading. By 8:30 it was lights out---and we were only mildly concerned that we might wake up at 5, unable to sleep longer. Dream on, literally. We slept until 6:30 or 7, in our cozy new down bags. And by the time we made breakfast and broke camp, it was almost 9 a.m., and the sun was out, drying things quickly (except for the tent, which was in our pack by then!). Still, 10 hours of sleep?